Electrical Vanguard series. Industrial standard pump for multiple applications: ideal for heavy construction and concrete stressing. Pumps are capable of starting under low voltage, they deliver oil at 0.9 l/min and can power cylinders up to 200 tons. 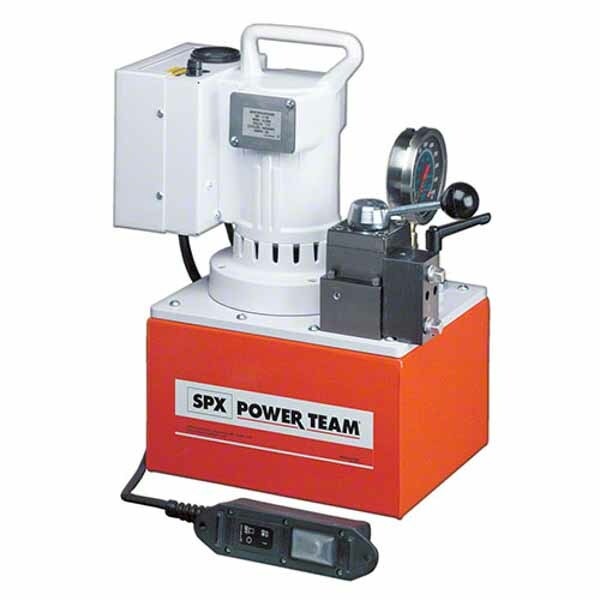 If you require a bespoke pump, our Power Team specialists can help you meet all your requirements. You can select from a whole raft of pre-engineered, off-the-shelf parts to service your specific requirements: in effect “customized” parts without the associated price. † Valves have "Posi-Check®" feature. †† Valving allows alternate and independent operation of two different spring return tools. Valve holds pressure only while valve is in "A" or "B" port position with pump motor shut off. ∞ Not to be used for lifting.